Merriam-Webster defines a coach as ‘one who instructs players in the fundamentals of a sport and directs team strategy’. Kirk Pointer was not only an instructor and director, but an influencer, role model and family member to Jada Lewis of the women’s basketball team. “He was an uncle figure to me; him and my dad were best friends, so we were always together,” said Lewis. Pointer, the founder of Nike Team Elite EYBL, passed away at the age of 43 on Nov. 5 from sudden cardiac arrest. Team Elite, an AAU team competes in the Early Youth Basketball League. They were the No. 1 team in the nation until Lewis’ final AAU year and the No. 1 team in the state of Georgia every year with Lewis. “He was a good coach because he demanded us to be great. We couldn’t even be on the team if we only wanted to be average,” said Lewis. Pointer demanded greatness on the court and worked hard so the girls could achieve greatness after they finished their AAU careers. Lewis was the No. 1 recruit in Georgia and 38th in the nation of class of 2016. She compiled numerous offers, ultimately choosing Georgia State. Phyllis Arthur Lewis, head coach at McEachern High School trusted her star guard would be ready for basketball season in the fall. “There was never any nervousness when Jada would be with Coach Kirk during the AAU season. Absolutely, I knew she was in great hands,” said Arthur. The passion Pointer lived with was different from most of the coaches she encountered. In turn, his uniqueness made players push themselves for him. “He was special because you can feel his love, and you knew he cared about you every time you stepped on the floor, so it made us want to play for him that much more,” said Lewis. Although she’s only a sophomore at Georgia State, Lewis is already a part of Panther history. In March, she was named to the Third Team All-Conference in the Sun Belt as the 2016-2017 Freshman of the Year. Lewis credits Pointer for the development of her basketball IQ, including how to attack the defense and make the correct decision. 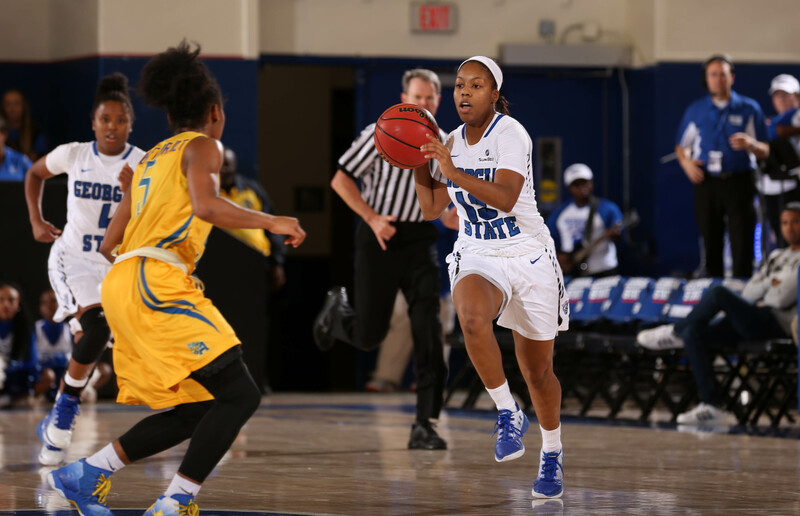 Those mental nuggets led her to play the eighth most minutes out of all Sun Belt players as an 18-year-old freshman. During Lewis’ first rodeo with Georgia State, Pointer made sure he kept in contact with Lewis. “He called me to congratulate me on my accomplishments, and he spoke with my dad almost every day. So, whether it was just a ‘hey’ through their conversation, we were always communicating in some way,” said Lewis. Lewis was not a stranger either. She returned to a few Team Elite practices after last season concluded to see coach Pointer. Pointer’s Twitter account was littered with posts campaigning for his players in hopes of universities coming across them. The Nike Team Elite’s Twitter account featured many condolences, appreciation and love for Pointer by all of his players at all levels after news about his death passed.